Just found this album last Friday in the free bin outside a local charity shop, without a sleeve and in pretty bad condition. There are big scratches over both sides, but it is a fun album to share, because the bands are anonymous, it mostly consists of folk songs that are in the public domain, plus, it has never been re-issued. Issued by the tiny local budget label Topas, and manufactured by the Phonocolor company, it´s probably the most amateurish Berlin beat album. Only, The Bounties, The Medussas, The Black Devils, and Die Floridas were not from Berlin. So, where were they from? I have no idea. There was a Black Devils group in Bochum. But is this the same group? 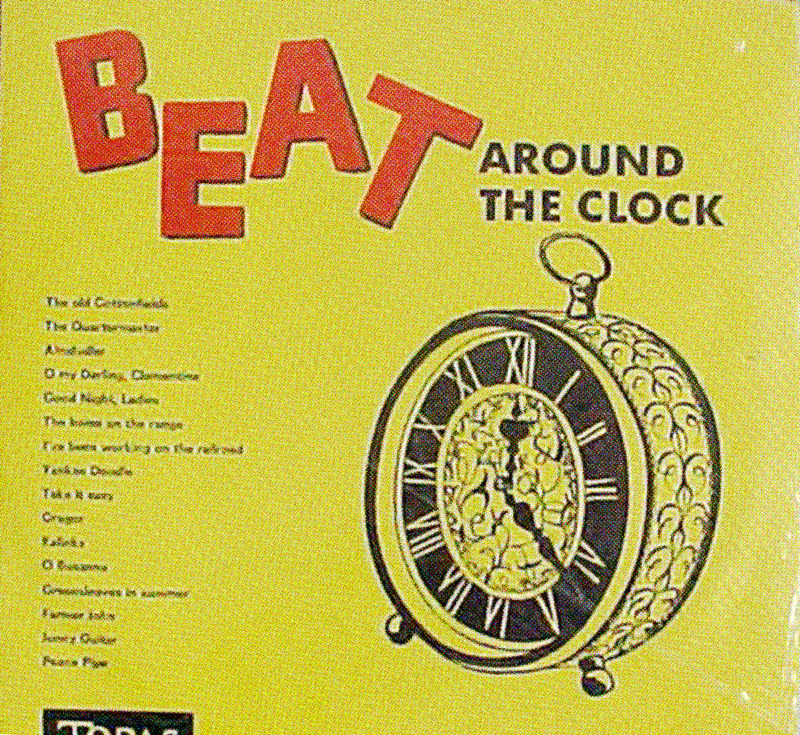 Topas was the LP branch of the super-budget flexi-disc labels Okay Exquisit and Rondo Spezial, that mostly issued 45s. I have posted Okay and Rondo releases repeatedly over the past years. Obviously, variety budget labels only cared for profit. But Topas went even further, with their habit of not assigning any specific names to the songs on the labels or on the sleeves. So which artists really played on this record? And when was it released? I simply chose the order of the bands on the labels, but maybe that´s not making matters easier. 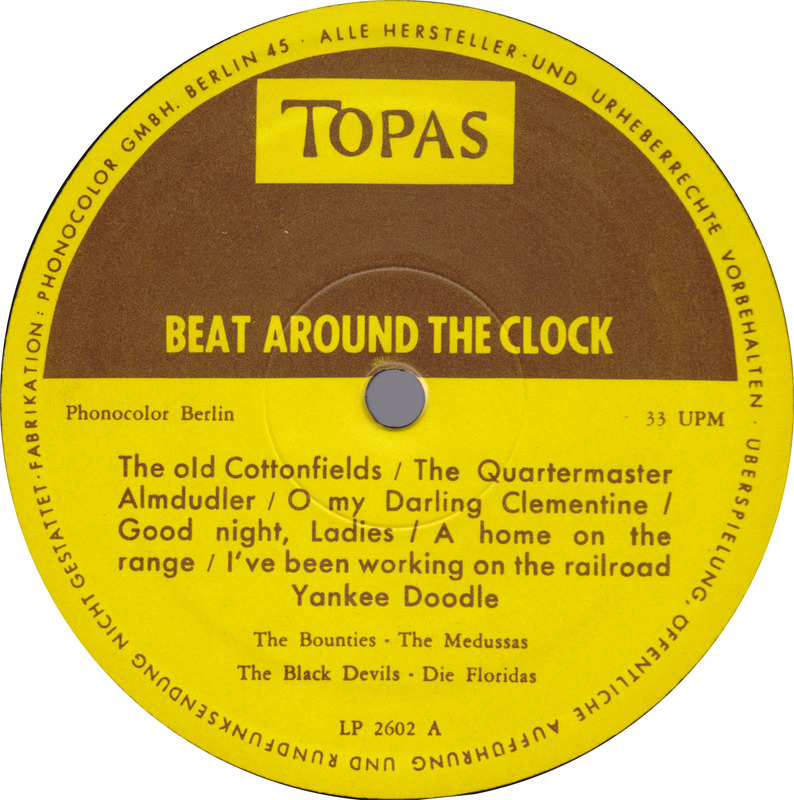 Another Topas LP (Melodie und Rhythmus, Topas # 2606) also features eight of these tracks (The Old Cottonfields, O my Darling Clementine, Almdudler, Gregor, Oh Susanna, Good Night Ladies, Greenleaves) but only features one beat group: The Black Devils. Still, are all these songs really performed by the same group? Cotton Fields was written and first recorded by Lead Belly in 1940. The Quartermaster’s Stores is a traditional British army song. The Shadows instrumental version of Quartermasster´s Stores (re-named after the BBC´s science fiction TV series Quartermass), was the flip side of their 1960 hit Apache. Almdudler is an Austrian soft drink, that was developed in 1957. The phrase auf der Alm dudeln, means “singing in the (alpine) meadows”. Austrians love Almdudler almost as much as Coke. A Radler variety (mixed with beer), is called Almradler. In the wine-growing regions of eastern Austria,Almdudler is mixed with locally produced white wine. Oh My Darling, Clementine is an American western folk ballad, or rather a parody of a ballad, written by Percy Montrose in 1884. Goodnight, Ladies is a folk song written in 1847 by Edwin Pearce Christy, founder of the blackface minstrel group Christy’s Minstrels. Home on the Range was originally written by Dr. Brewster M. Higley in the early 1870s. It´s also the state song of the American state of Kansas. .
I’ve Been Working on the Railroad is an American folk song, first published as “Levee Song” in 1894. Yankee Doodle is a American patriotic song that dates back to the mid-18th century. Also the state anthem of Connecticut. As a term, Doodle first appeared in the early seventeenth century, and is thought to derive from the Low German dudel or dödel, meaning “fool” or “simpleton”. This is not the classic German beat tune by Drafi Deutscher & Manuela. Probably a self-written song. “Gehe nicht, o Gregor” is a Ukrainian folk song, with German lyrics written in the early 1930s by German Boy Scouts leaders Eberhard Köbel and Günther Wolff. The tune is still sung by German Boy Scouts today. “Kalinka” (Russian: Калинка) is a Russian song written in 1860 by Ivan Larionov. The refrain of the song refers to the kalinka, which is the snowball tree. Oh! Susanna , a minstrel song by Stephen Foster, was first published in 1848. My favorite track. Great piercing organ sound! The Green Leaves of Summer was written by Dimitri Tiomkin for the 1960 film The Alamo. In 1961 the song was nominated for an Academy Award. Ultra-garage version of The Searchers cover of Don & Dewey’s Farmer John. Johnny Guitar was written by Peggy Lee for the 1954 film Johnny Guitar, directed by Nicholas Ray and starring Joan Crawford. “Die Floridas” – What a great band name!